More info:Plus local payment from USD 770 to USD 780. From Argentina’s grasslands to the high Altiplano in Bolivia, this 21-day overland truck tour takes you through some of South America’s most unusual and beautiful landscapes. You set out from Santiago in Chile, travelling across the Andes into Argentina to explore the country’s wine capital, Mendoza, tucked in the shadow of the mountains. Next enjoy a special and unique two days with the gauchos on an estancia stay, learning their skills and riding horses from this idyllic country ranch. 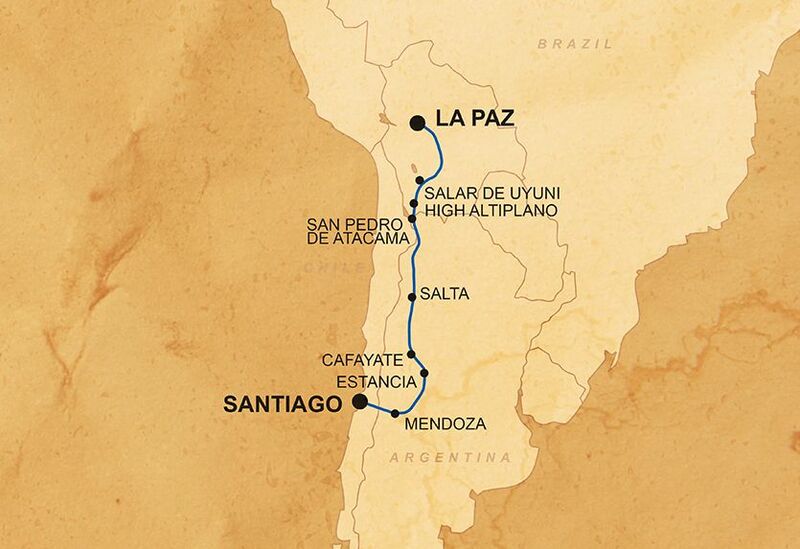 Travel north from here through the wine regions and highlands of northwest Argentina, to the Spanish colonial town of Salta which sits at the heart of Argentian’s beautiful arid regions. Then head over the Andes to the atmospheric town of San Pedro de Atacama, in Chile’s Atacama Desert. The unreal wilderness of the high Altiplano now unfolds, with the dramatic expanse of the salt plains of Salar de Uyuni a must-see stop on our journey and one of South America’s most incredible natural wonders. Before finishing your journey in the Bolivian capital La Paz, you’ll visit the famous mining town of Potosí and enjoy an overnight homestay with the local community of Livichuco in the Bolivian Andes. On this epic trip through Bolivia, Argentina, and Chile, we will be travelling using a combination of overland vehicles and 4x4s, thus cutting out the need for air travel and reducing carbon-emissions. Going overland (by car and on foot for excursions) means you get to experience physically crossing the borders between countries as well as explore places which are off the beaten track. Wherever we are in the world, we prefer to use smaller locally-owned businesses, ensuring that local communities gain a direct economic benefit from our business, for example, we use small locally owned hotels, campsites and activity providers wherever possible. In Livichuco we stay in guesthouses within the rural community, which provide local rural people with tourist revenue and employment, as well as providing a superb opportunity for local interaction. We use local guides and operators throughout the trip; for example, in the Anglo-Argentinian Estancia near Cordoba, we use a responsible local operator that provides training and employment to many local people as guides, providing them with stable employment in the tourism industry.